The Cabinet on Monday in principle approved the draft of “The Fertiliser (Management) Amendment) Act, 2018” with provision of harsher punishment for selling adulterated fertiliser. 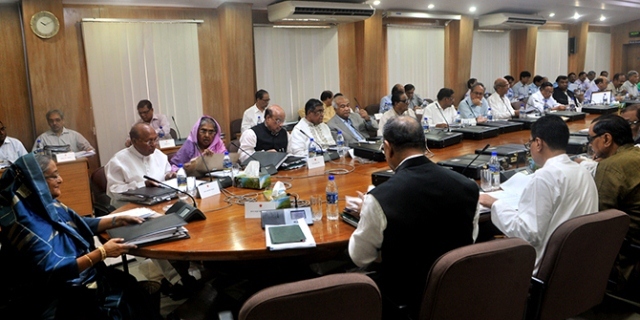 Briefing reporters after the meeting, Cabinet Secretary Mohammad Shafiul Alam said according to the draft law, the punishment for selling adulterated fertiliser would be two-year imprisonment or Tk five lakh fine or both, reports UNB. The punishment in the existing law is six-month imprisonment or Tk 30,000 fine or both. The Cabinet Secretary said according to the draft law, entire Rajshahi and Rangpur divisions will come under the BMDA instead of only greater Rajshahi's four districts- Rajshahi, Bogra, Rangpur and Dinajpur districts. About the structure of the BMDA, he said there will be an advisory council headed by the Agriculture Minister which will be responsible for drafting policy. Shafiul said there will also be an 11-member board of directors with Chairman of the authority as its Chairman and the board will accomplish its day-to-day works. During wartime and crisis moment of the country, all paramilitary and supportive forces like Police, BGB, Coast Guard and BNCC will work under operational command of the Armed Forces, he said. Besides, another condolence motion was also adopted by the cabinet expressing deep shock at the death of noted freedom fighter and sculptor Ferdousi Priyabhashini. The cabinet okayed a proposal for declaration of the Capital and Maintenance Dredging Component of Rabnabad Channel at Paira Port as a National Priority Project (NPP). Besides, the meeting approved the draft of the Addendum-1 to ‘Inter-Agency Agreement between Global Centre for Nuclear Energy Partnership of India and Bangladesh Atomic Energy Commission on Cooperation regarding Rooppur Nuclear Power Plant project.